Posted bySareesh Sudhakaran	 September 5, 2013 August 19, 2017 12 Comments on What is 6G-SDI? SDI is a production-centric technology. Its purpose is to help you move data around on a production between devices without sacrificing quality. What’s the best way to monitor video? It works great for 1080p, and with dual 3G-SDI you can transport a full 12-bit 4:4:4 or RGB 1080p60 feed with space for audio and metadata as well. You can even do 2K. But, what about 4K? If what you’re shooting is limited to 1080p60 at the highest quality, you don’t need anything better than 3G-SDI. In fact, unless you are designing a live broadcast switching environment, you don’t even have to worry about what standard you’re working with because the camera manufacturer has thought it out for you. With 4K, you are probably expecting to follow that trend. To this affect, many devices have been announced (some are even available) that support a standard called 6G-SDI. It is an SDI standard that is intended to be twice as fast as 3G-SDI (2.97 Gbps), which means it’s supposed to deliver a payload of 5.94 Gbps. It hasn’t been ratified by the SMPTE yet, but with so many 4K cameras available in production one wonders why it’s taking too long. Let’s find out the reason. To calculate data rates of various video formats, use the formulas I’ve outlined in The costs of working with 2K and 4K uncompressed data. Green means it’ll work. Red means no go. 1080p30 is the best HD-SDI can do. 3G-SDI cannot do 4:4:4 1080p at 60 fps. 6G-SDI will breeze past every limitation in 3G-SDI. This is beneficial especially when you want to transmit stereoscopic data over a cable (though it is somewhat limited in practice because each camera will have a separate BNC connection). 6G-SDI cannot do 4:4:4 4K, even at 30p – neither in 10-bit nor 12-bit. This is the biggie. 6G-SDI can do 4K RAW, even at 60p – now you know why camera manufacturers are happy to give you RAW data instead of RGB or 4:4:4. Even 12G-SDI or dual 6G-SDI cannot do 4:4:4 or RGB 4K at 60p! These two formats are marked in red. 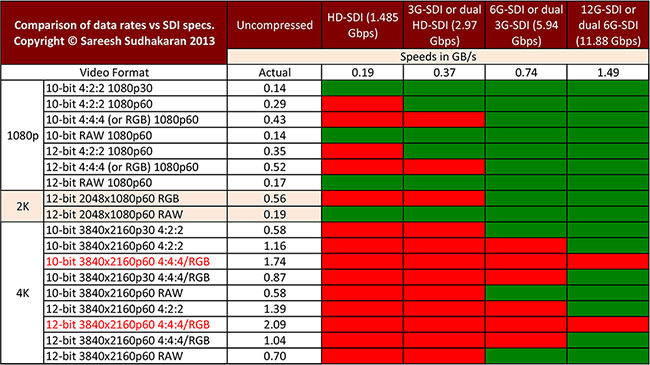 If all you’re shooting is RAW, then 6G-SDI can cover most scenarios, except 16-bit RAW (not in chart). The story isn’t this simple though. According to this EBU whitepaper, as the signal payload reaches 3 Gbps (in 3G-SDI), the strength of the signal drops by 40%! Fiber performs better than copper cables here, but are more expensive. The point is, you shouldn’t drive a standard to its limits in normal use. What do we learn? For one, 6G-SDI does not really help if we are looking for a scaled-up version of SDI. 4K is four-times the data rate, so we need a standard that is four times as fast as 3G-SDI. Even that (12G-SDI) cannot do 10-bit 4Kp60 in RGB. Only opt for 6G-SDI for 4K RAW data transfer. If you’re not shooting RAW then it is pointless. The guys at SMPTE know all this, which is probably why they’re not to rushed to ratify 6G-SDI; because after all, SDI is all about 1080p uncompressed RGB data, not RAW – let alone 4K. 4K RAW data over SDI is a special case first used in the Arri Alexa, and now available in the Sony FS700, etc. And it will be interesting if SMPTE includes RAW (4K or Quad HD is almost a given) in their 6G-SDI specification – now that will be something very useful, and a first. For a brilliant but technical overview on this subject, read this whitepaper: 3Gb/s SDI for Transport of 1080p50/60, 3D, 4k and Beyond, by John Hudson, Director Broadcast Technology, Semtech (formerly Gennum). PhilosoScience RAW video does not contain color per se, with the bayer filter on the sensor it appears as a monochrome image where the filter causes certain pixels to only be sensitive to certain wavelengths of light (red, green and blue), so the debayer process must be done externally at the SDI receiver device. When you output RGB or YUV from the camera, it’s performing the debayer process for you and basically tripling the data rate by converting the single channel raw bayered stream into 3 separate channels (R/G/B or Y/U/V). Hope this helps. “SDI is all about 1080p uncompressed RGB data”? SDI has been a broadcast interface first and foremost, and broadcast has been YUV 4:2:2 for decades. Still, when someone says “SDI” without any other clarification, I assume they mean 1.5Gbps HD-SDI in YUV (YCbCr) 4:2:2. Granted, it’s all changing now (and at an exponential rate) of course, and of course 3G-SDI, RGB, and 4:4:4 are extremely useful in acquisition and color-critical workflows. I’m just pointing out that at this point they’re a minority. Rec. 2020 supports UHD in RGB and YCbCr, in 4:4:4 and 4:2:2, so it remains to be seen what would emerge to be the common choice. ssclukey Looks like you’re right! The one in black should be 30p. Thank you for bringing it to my attention. I think there is an error in the table. You have “12-bit 3840x2160p60 4:4:4/RGB” twice with different data rates. Was the second one supposed to be 30p perhaps? DocentWeb Thanks for sharing! Looks like they’re just using it as a BNC connector, and not 3G-SDI. Unless I’m mistaken, the Sony FS700 outputs 12-bit 4K raw over a single 3G-SDI. PhilosoScience Check out my articles on RAW and uncompressed file sizes in the Learning Center. I’m confused as to why RAW takes less bandwidth than 4:4:4 / RGB.